Once again, the delightfully cheeky Ruby the reindeer is causing all kinds of chaos on Christmas Eve. 'I miss Dasher and Dancer and Prancer and Vixen! Oh, Comet! Oh, Cupid! Oh, Donner and Blitzen! And big brother Rudolph! I wish they were here!' Sobbed the naughtiest, loneliest little reindeer. This Christmas, Ruby's family is visiting Granny and Pop, whose house full of breakable items is not the place for a very naughty reindeer. 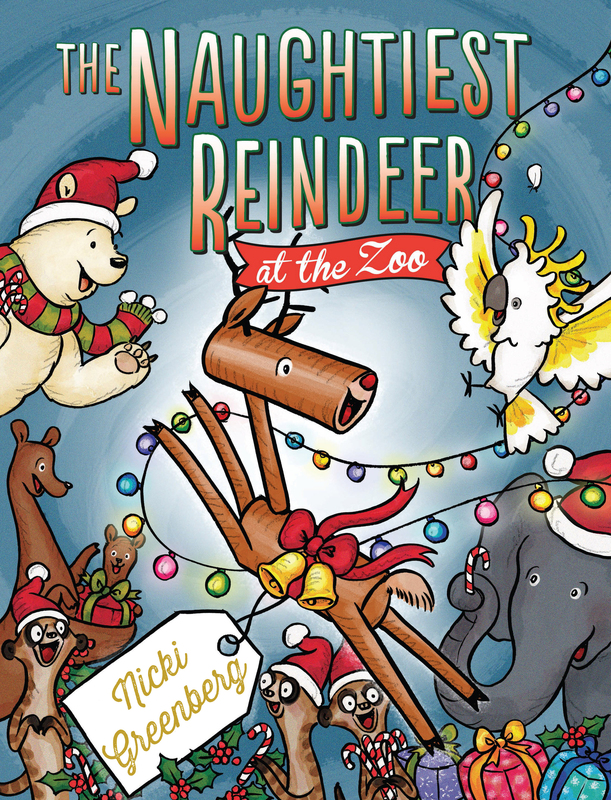 So Ruby is sent to the zoo for the holidays, and she has to bunk in with the stuck-up antelopes and the fussy zebras, which is no fun at all for an excitable reindeer. So on Christmas Eve, Ruby opens all the enclosures hoping for fabulous festivities and feasting - and creates chaos! With all the animals on the loose, and Santa delayed from delivering all his presents - how can Ruby right her wrongs and save Christmas for everyone? Ruby is at her mischievous best in this rollicking Christmas treat. Last year when Rudolph was too sick to lead Santa’s sleigh, Santa made the mistake of getting his cousin Ruby to do the job and she created havoc in the homes near Granny’s place and so when the opportunity to leave her behind arose, Santa grasped it. This time when the family go away to spend Christmas with Granny and Pa, they leave Ruby at the zoo. Poor Ruby. She feels lonely and abandoned at the zoo which is quiet and no fun at all. When Polly the cockatoo tells her that the zoo is the worst place to be on Christmas Day, she is even more disheartened. "Oi, red nose!” a voice squeaked. “Don’t make such a fuss! There’s no joy at Christmas for any of us. Nicki Greenberg has created another fun story which rollicks along in rhyming verse pulling listeners and readers along towards its crescendo. The action-packed pictures all add to the atmosphere of mayhem and bedlam and you wonder if calm will ever be restored to what should be the most peaceful night of the year. Young audiences will be drawn into this story with Ruby becoming a favourite character so they will demand that it be read over and over. But that’s okay because there is so much in both the text (like the echo of that other famous Christmas poem) and the pictures that each read is a new adventure. Definitely in the Christmas Countdown collection along with the original story. A double dose for special children.